Tupenny Cottage is a single storey holiday cottage with a living/dining room, kitchen, bathroom and bedroom with kingsize bed. 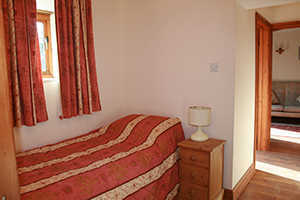 Outside the bedroom there is an alcove with full size single bed. 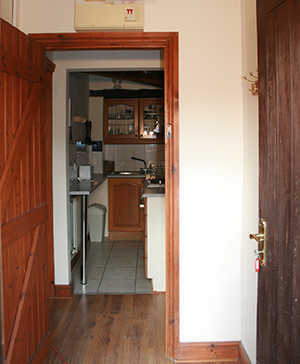 The cottage has original beams and looks out over a large grassed area. The self catering accommodation is located within the heart of the Cotswolds near the idyllic and historic town of Cirencester. 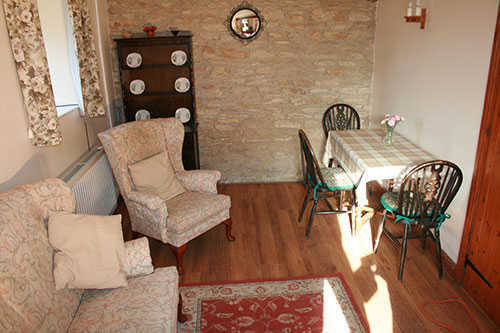 Lounge/diner has original beams, an exposed stone wall, window seat, colour T.V and DVD player. Fitted kitchen with fridge, electric and microwave cookers. Double bedroom and outside of the bedroom an alcove with a single bed. Bathroom with an over bath shower and shaver point. 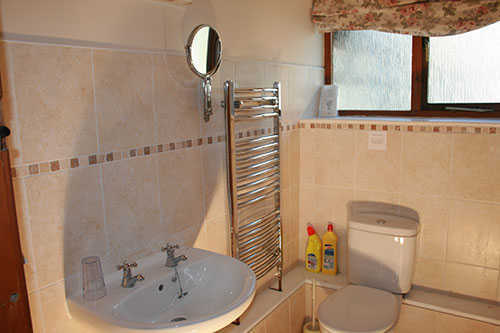 All of our holiday lets offer self catering accommodation. We loved our stay in little Tupenny Cottage, and our dog enjoyed herself too. Arriving in the lambing season, we had the privilege of helping to feed the orphaned lambs which were being kept in a small pen opposite the front door; and just a few yards away were the chickens which provided us with lovely eggs during our week. Alison and Anthony were very welcoming and were more than happy to tell us all about the workings of the farm. We even had a couple of Land Rover “safaris” around the fields to check their many sheep and lambs. Luckily for us, the River Thames was shallow enough to drive through! Apparently, during the summer you can walk across it and a field to the pub in the nearby village. We found the accommodation perfect for two (and a dog! ), although there is also a single bed. 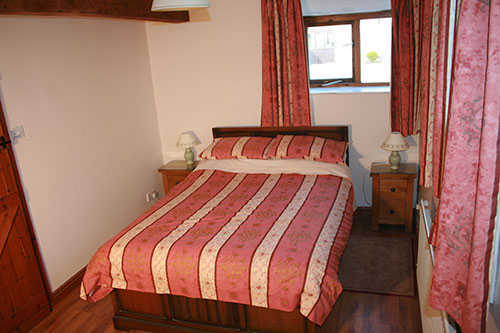 The cottage was spotlessly clean when we entered, and the bed linen was luxurious. The lane to Old Mill Cottages is on a crossroads, but the three intersecting lanes are designated “quiet” lanes where people can walk rather than drive. Apart from the occasional gateway or small passing place, they are single track, and I for one was very pleased to find there wasn’t much traffic. We found Tupenny Cottage was a great base from which to explore the area and would visit again. One quirky event was a tapping noise on one of the windows which turned out to be a pied wagtail trying to eat the flowers in the vase on the sill inside!! To make a booking at Stable Cottage please use the online booking calendar. You can view prices on the tariff page, the prices listed include heating, lighting, bed linen and towels. A deposit of 25% per week is required upon booking. The full balance is then due 4 weeks prior to arrival. We accept credit cards or cheques as payment. If paying by cheque, they should be made payable to Old Mill Cottages and sent to Alison Claxton, Old Mill Farm, Poole Keynes, Cirencester, Gloucestershire, GL7 6ED. In the event of cancellation, we will try to re-let and if successful refund your money. If we cannot re-let we will retain the money already paid. We therefore strongly advise holiday cancellation insurance. Guests may arrive anytime after 3 pm and we ask that you vacate the cottages by 10 am upon departure. The holiday lets are all dog friendly and well behaved dogs are allowed at a cost of £20 each per stay.